A goalless draw suits Bray more, as they look to pull clear of the relegation zone. Tempers flared during a tight game. 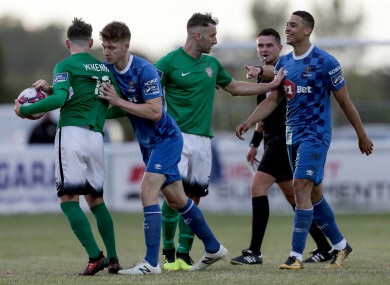 IT WAS ANOTHER evening to forgot by the seaside for Waterford FC as they dropped another two points at the Carlisle Grounds. An injury time penalty from Gary McCabe rescued a point for Bray in May but a scoreless draw tonight means it’s four points left behind in Co Wicklow for the Blues. Both sides were toothless in front of goal and can have few complaints about the result which suits the Seagulls far more than Waterford. Matthew Connor was forced into the first save of the evening on 18 minutes. Cory Galvin allowed Kevin Lynch’s throw-in to roll across his body and he caught it sweetly on the half-volley but Connor leapt to his right and he turned it behind. There was a nervy moment for Evan Moran when he declined to clear and instead tried to pass to a colleague. His attempt only found Ismahil Akinade, who squared it for Courtney Duffus but he was denied by a brilliant block from Rhys Gorman. Waterford’s defence failed to spot the run of Craig Walsh on the stroke of half time but McKenna noticed and picked him out. Walsh side-stepped Connor in the six-yard box but the angle was so tight that he couldn’t shoot. Waterford survived that moment but from the next phase, Ronan Coughlan’s cross was deflected by Bastien Hery and very nearly flew into the Waterford net. Duffus stung Moran’s fingertips when he cut in off the left and let fly. Moran spilled the strike but a defender hacked clear before Akinade could pounce. Both sides spurned their best chances of the tie within 60 seconds of each other. Dan Kelly galloped clear down the right for Bray and knocked it into the middle for Coughlan but he fired meekly straight at Connor. At the other end, John Martin released Akinade who had a defender breathing down his neck and perhaps that played a part as he drilled over. Bray Wanderers: Evan Moran; Sean Harding, Rhys Gorman,Sean Heaney, Kevin Lynch; Paul O’Conor, Dan McKenna; Daniel Kelly, Craig Walsh, Cory Galvin (Jake Kelly, 90+1); Ronan Coughlan. Waterford FC: Matthew Connor; Dylan Barnett, Rory Feely, Kenny Browne, Derek Daly; Bastien Hery; John Martin (Dean Walsh, 80), Sander Puri; Gavan Holohan (Dean O’Halloran, 41); Courtney Duffus, Ismahil Akinade. Email “More frustration for Waterford as they drop points in stalemate by the seaside ”. Feedback on “More frustration for Waterford as they drop points in stalemate by the seaside ”.